According to recent survey, four out of five Americans spend significant amount of time in front of their computer or on a handheld device. Between work and home many people spend more than 10 hours everyday on a computer! Newer devices are getting even smaller and more portable, which makes them easier to carry but more difficult to see. Added to an ever-aging population and the situation is set for an increase in vision problems. Computer vision syndrome is a term often used to describe a type of visual discomfort, but it doesn’t necessarily have to be in front of a computer. Any electronic display can cause the same symptoms including eyestrain, headaches, visual fatigue, blurred vision or loss of focus. Electronic displays use pixels to display words, and these pixels give less contrast than the usual black-on-white print our eyes are used to. This causes more focusing, squinting and straining to read. With a computer, often times you can make the text large enough so that it is comfortable, but with a small portable device there is less screen real estate to increase the text size. In addition, people tend to hold these small devices very close to their eyes, which increases strain even more. New spectacle lenses are available that can help with today’s technology. Essilor has developed a lens that has a small magnifying area towards the bottom, designed specifically for handheld devices. When you look far away, your distance vision remains crisp and clear, but when you shift your focus up close, your near work is larger and easier to see. This is only one of many new and excited developments in eye care. 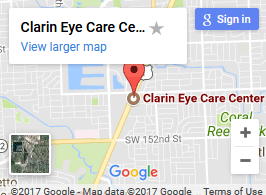 This information is brought to you by Clarin Eye Care Center. Please call or contact our office for more information.